Seattle on a sunny spring day is one of the most beautiful places to be. Colorful daffodils and cherry blossoms brighten everything up. You will have a clear view of Mt Rainer and the Olympic mountains over the Sound. Unfortunately, we don’t always get a lot of those types of days. I mean, it is Seattle; and spring can sometimes feel like an extension of winter. Whenever we do a get a day (or couple of days) of true Spring, it seems to inspire everyone. Parks are full of happy kids, the favorite hiking spots are packed, any restaurant with a good view of the water will be very busy. Farmer’s Markets are bustling, it’s an amazing place. All this activity inspires me to cook food that matches the settings: colorful, vibrant, healthy, something you would enjoy eating on the patio or as a picnic. But at the same time I want to prepare dishes that can be prepped ahead of time and are not too time consuming. Because, I also want some time to go hiking, or just sit on patio and enjoy the sunset with a glass of Washington wine. 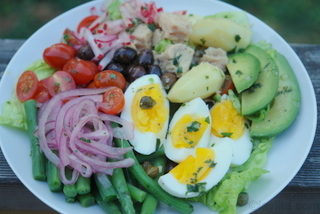 Classic Nicoise salad recipe - tuna fish, potatoes, green beans, hard-boiled eggs, tomatoes, olives and capers - with a Latin twist by adding avocado slices, lime marinated onions and a spicy serrano cilantro vinaigrette. 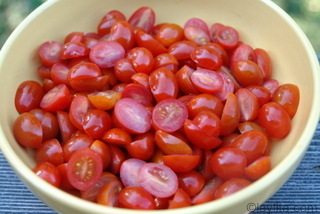 Marinate the red onions slices in the lime juice with ½ tsp of salt for at least 30 minutes. 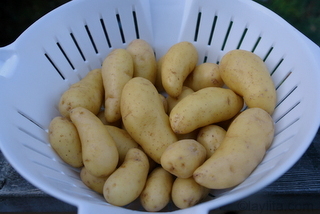 Cook the fingerling potatoes in boiling water and boil until tender but still firm, about 8 minutes. Drain and let them cool down. 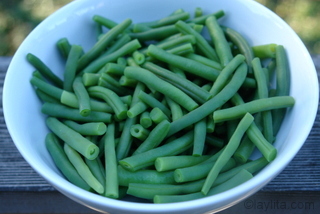 Cook the green beans in boiling water until they are bright green and slightly tender, about 4-5 minutes. Drain them and let them cool down in ice cold water to keep from overcooking and turning brown. To make the vinaigrette for the Nicoise salad, combine the lemon juice, crushed garlic cloves, mustard, chopped parsley, chopped cilantro, diced Serrano pepper, olive oil, salt and pepper in a bowl or container with a tight lid. 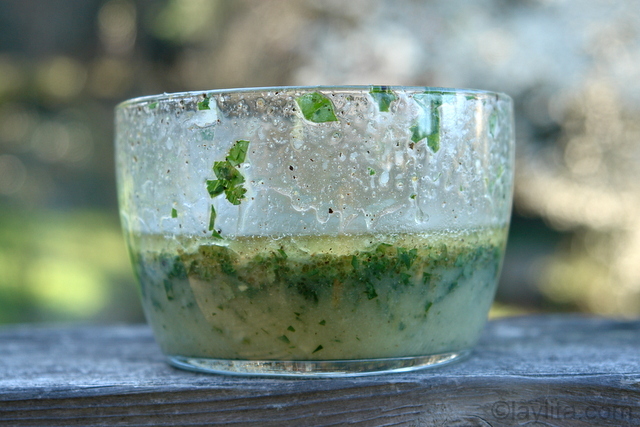 With the lid on shake the bowl until all the ingredients are blended together. 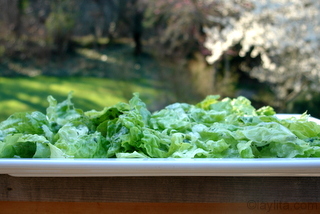 Toss the lettuce with ¼ of the vinaigrette and place on a large platter. 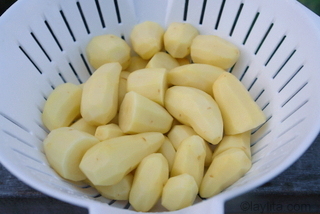 Toss the fingerling potatoes with another ¼ of the vinaigrette. 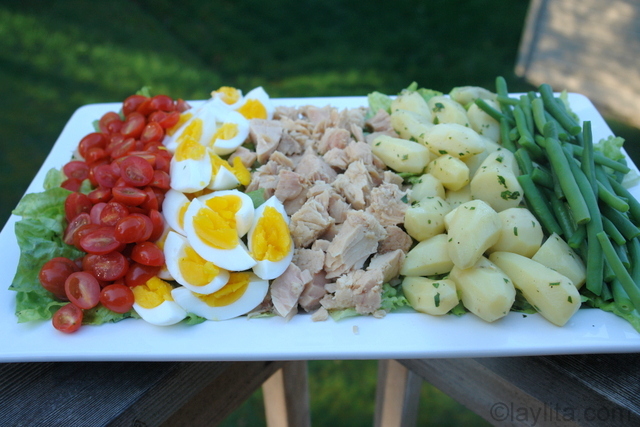 Arrange the cherry tomato halves, the hard-boiled eggs, tuna fish, potatoes and green beans on the platter. 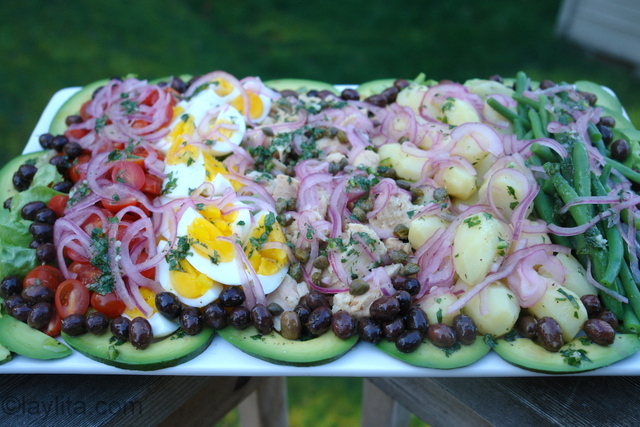 Arrange the avocado slices around the edges of the salad platter, add the olives and capers. Sprinkle the marinated onion, julienned radish bits, and the rest of the salad dressing over the salad. 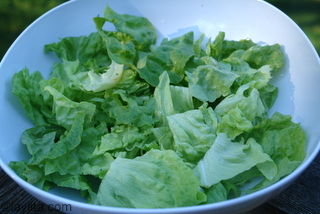 I wanted to make a salad that would be delicious and refreshing, but also have enough substance to be a satisfying meal. 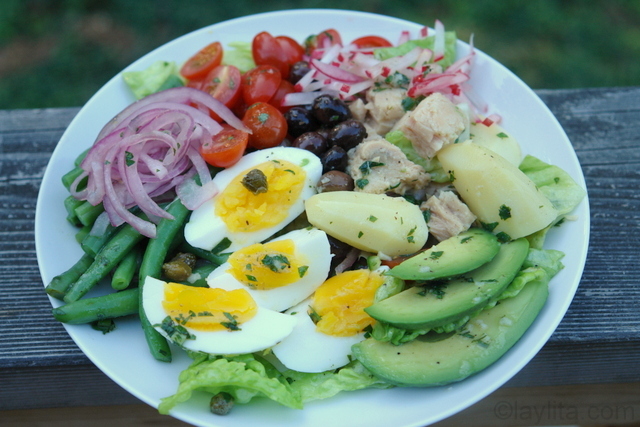 A nicoise salad would be perfect. Its colors match the spring colors and it has a great variety of flavors. This classic French salad originated in the town of Nice (supposedly) and has many variations. 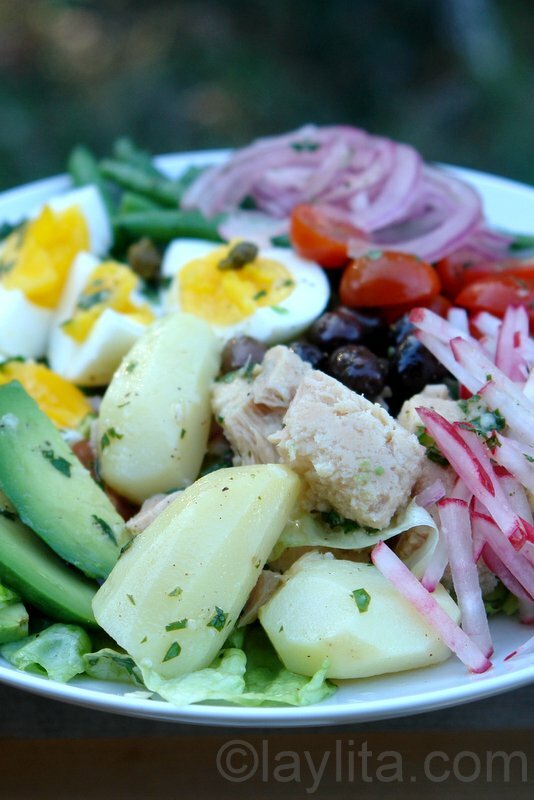 But most include tuna fish, potatoes, green beans, hard-boiled eggs, tomatoes, Nicoise olives and capers. If you have time and want to give it a fresh twist, you can use fresh tuna – grilled or seared – or even cure your own. 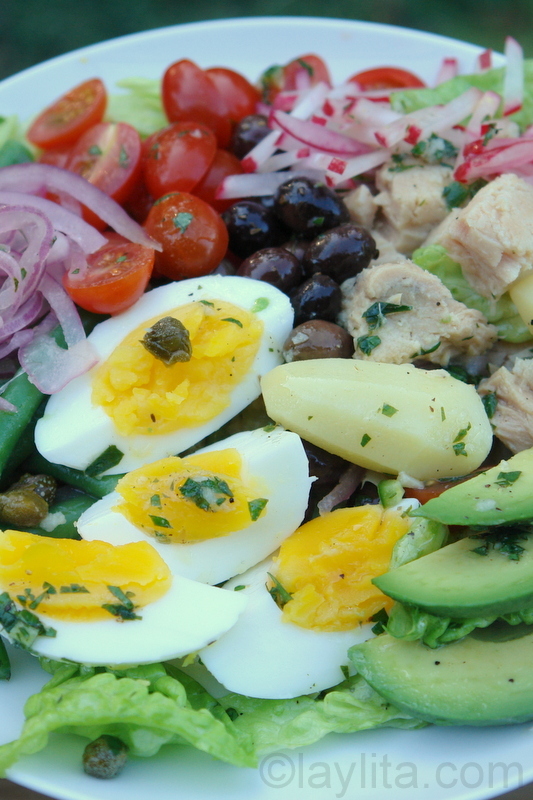 One of the best nicoise salads I had was in Walla Walla at small French restaurant called Brasserie Four. 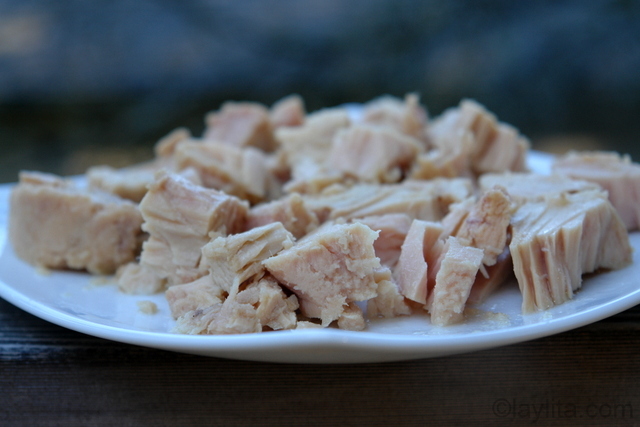 They cured their own tuna and it was spectacular. 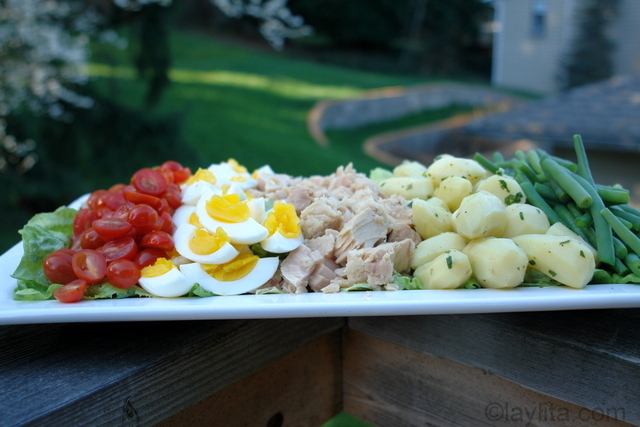 Of course, I had to mess with a classic and add some non-traditional ingredients to my nicoise salad. I used avocado slices, lime marinated onions, and yes, cilantro and Serrano peppers in the vinaigrette. 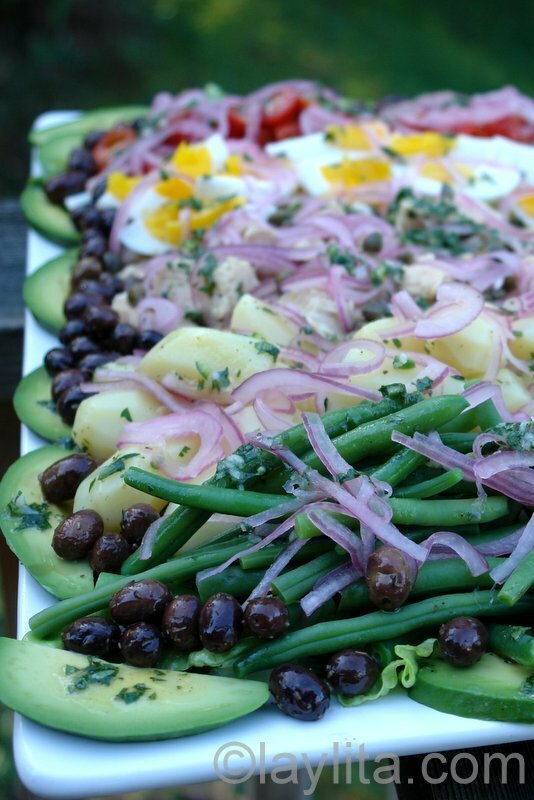 This nicoise salad is also great for parties. 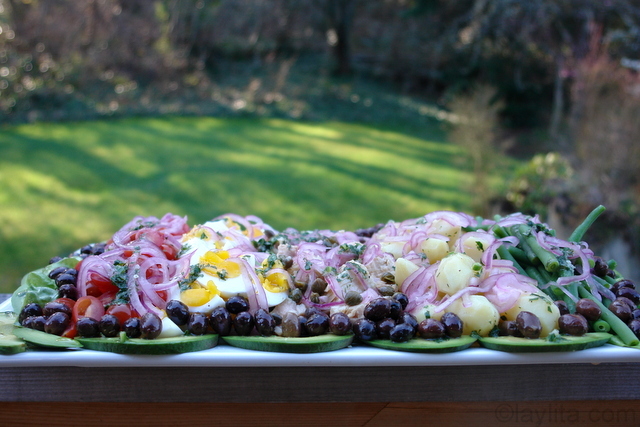 Salads are must-have whenever I have a lunch or dinner party. I like to have a large salad platter that is colorful and inviting, people should be excited about eating a salad. Since I served it on a platter, I didn’t want people to worry about having to toss the salad. So I mixed part of the vinaigrette with the lettuce and potatoes before arranging them on the salad platter. The quantities in this salad will serve 8-10 people. Looks very good, but your hard boiled eggs are not properly cooked — they are very obviously still gooey in the yolk and that is not right. 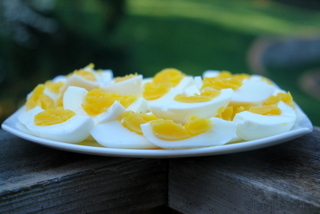 I completely disagree, boiled eggs are best when the yolk is still soft. But if you prefer them cooked more, then go ahead. This looks so nice and refreshing. 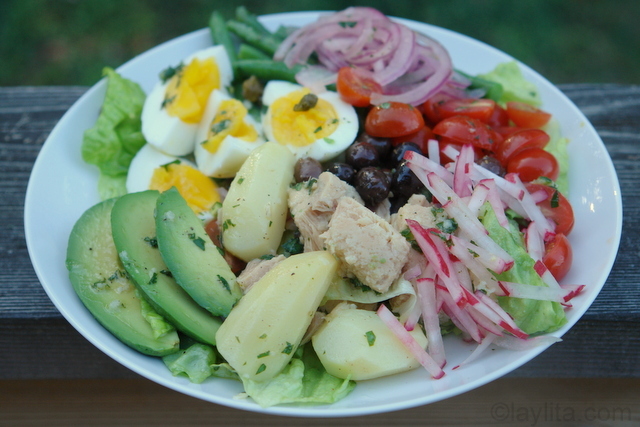 Nicoise salad is my favorite, and the serrano pepper sounds like a very interesting addition. I love all things Procençale, so this is a welcome post! Personally I think avocado should always get an invite to the party. Que delicia de Niçoise. Me ha encantado el toque latino que le has dado con el aguacate y el aderezo. A por cierto, coincido contigo en lo de ofrecer una ensalada en las reuniones en casa. Delicious as always, great recipe. Thanks for posting. Ayyyy si veo esta ensalada me aprece que ya ha llegado el verano!! :D por cierto hice la masa de empanadas….ya no quiero otra receta, es la mejor! I love the Latin twist. 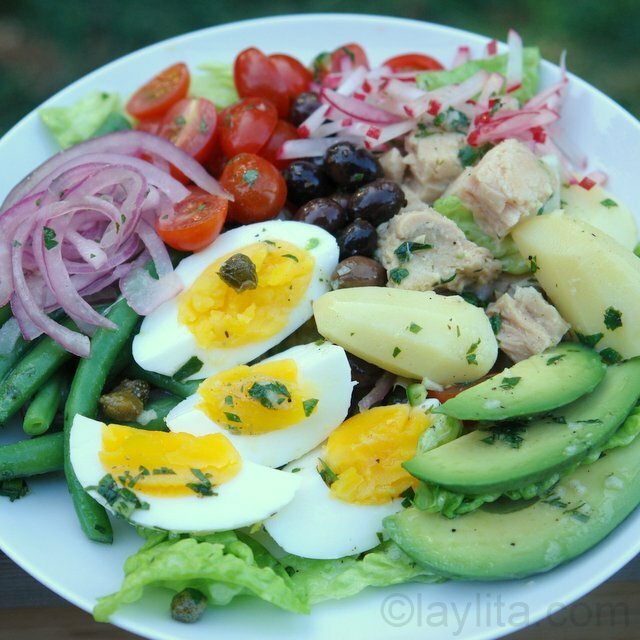 I love Nicoise salads and can’t wait to try this “kicked-up” version of it! Thanks for the inspiration and recipe! Muchas gracias por la receta. Justamente lo que necesitaba para la cena de este sabado!